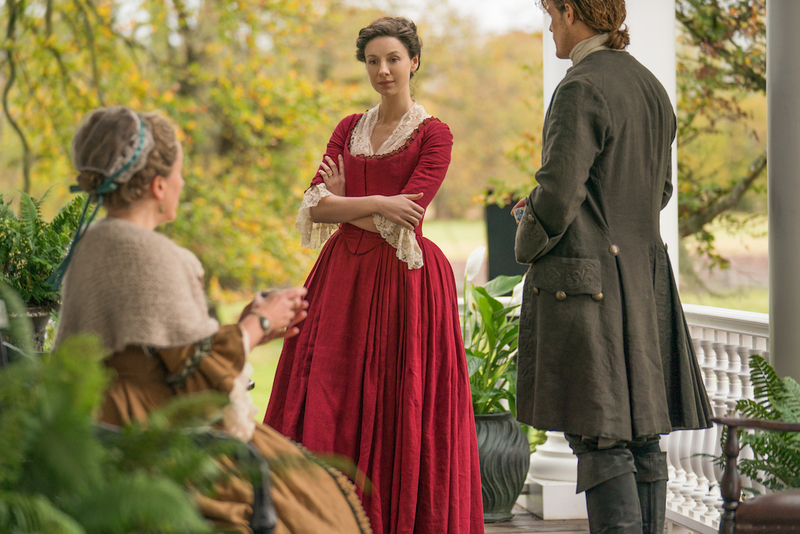 Jamie and Claire arrive at River Run and reunite with Jamie’s Aunt Jocasta. However, by the end of the episode it becomes abundantly clear that plantation life isn’t for them. 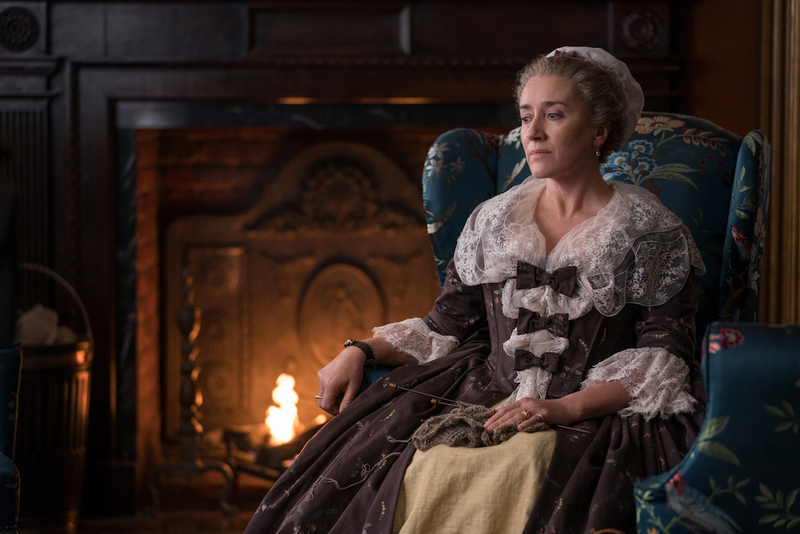 We recap/review Outlander, “Do No Harm”! FYI: I’m still here, still believing Bear McCreary and Raya Yarborough are geniuses because OMG Skye Boat Song! In the aftermath of Bonnet’s attack, Jamie and Claire are not OK.They weren’t able to properly bury Lesley, but worse is Jamie feeling guilt for trusting Bonnet and helping him to escape the noose. He’s devastated that he couldn’t protect Claire, but also that Bonnet and his folks are still out there to prey on others. Plus, without the gems, now they’re penniless. Claire tries to lighten the mood and reminds Jamie that he had nothing when they got married. She also suggests that they can turn to Jocasta for aid. In that moment, the barge is arriving at its destination and all are Impressed by River Run Plantation. 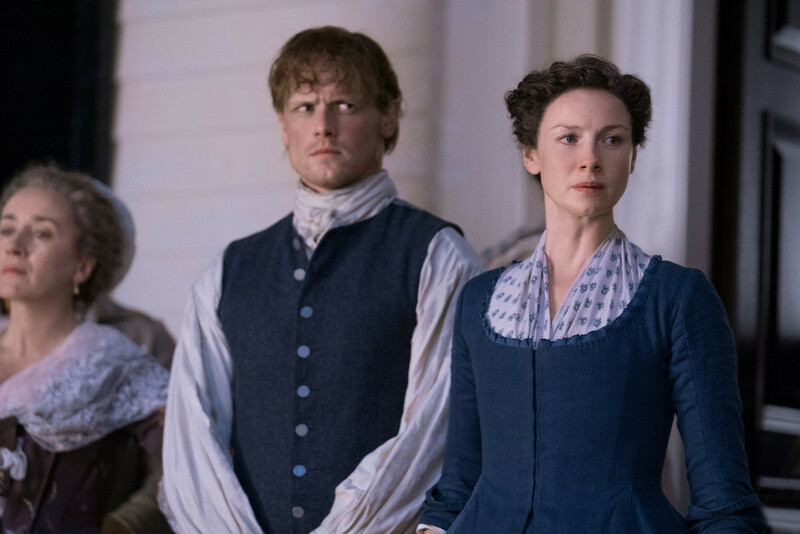 It’s an emotional reunion as Jocasta welcomes Jamie and Claire to River Run. She embraces him and remarks how tall he is… that MacKenzie blood in him… and commiserate over missing Jamie’s mother. Auntie Jocasta greets Claire and reminds them that they’re also family. When Jamie introduces Wee Ian, he’s enthusiastic and presents Auntie Jocasta with flowers. This is where we realize that Jocasta is blind. With help from Ulysses, who tells her that Ian has flowers for her, they make the exchange. Jocasta still sees shapes and shadows, but it has been awhile since she’s lost her sight. But it’s enhanced her other abilities, like her hearing and being able to discern truth from lie. Over tea, Jamie tells Auntie Jocasta about Bonnet’s attack. She also tells Jamie it isn’t his fault. Jocasta invites them to stay at River Run for as long as they like. Cape Fear society will welcome them, plus Auntie Jocasta could use a man like Jamie with a head for business around. In fact, she’s been keeping up with his work in France and Scotland. Auntie Jocasta plans to host a party to Jamie and Claire. Unfortunately, Rollo got sprayed by a skunk, LOL! John Quincy Meyers, one of Jocasta’s guests suggests a remedy to bathing Rollo in vinegar. A young slave boy brings the vinegar and fills the bath with water. Ian likes Meyers’ beard and says so… he’s also really curious about the Indians (Native Americans). Meyers tells them about different tribes and potential conflict. Indians don’t sound much different than Highlanders. Ulysses leads Jamie and Claire to their room and they see how lovely the estate is… Jamie tells Claire that Jocasta reminds him exactly of his mom. When they arrive, there are slaves getting the room ready. When the two women slaves (Phaedre and Mary) greet them, Claire tells them to call her by her first name. Everyone is verrrrrrrrrry uncomfortable with that. Claire amends it to call them Mistress Claire. But she isn’t at all happy with plantation life and the institution of slavery. Jamie encourages her that one that it will be different. After a tour, Jocasta tells Jamie that they produce tobacco, indigo, cotton, pine, and the saw mill, which is the biggest source of revenue. The partnership between Hector and Jocasta has been successful. Jamie asks about the slave labor, and Jocasta tells him that there are 152. She purchased them so as to keep parents with their children and treat them with benevolence. They were expensive, but where would they be with her giving them work and purpose? In fact Jocasta would consider some of the slaves as friends. (In this moment, I share Claire’s EPIC eye roll.) Claire suggests to Jocasta that the slave might feel differently, seeing as they don’t have much choice in the matter. Jocasta seems tickled by the exchange, but Claire leaves to join Phaedre in the garden to gather herbs. Lieutenant Wolff, one of Jocasta’s clients in the Navy arrives to discuss Jocasta growing wheat at River Run, especially since the King’s Navy is always looking a healthy crop to purchase. Jamie laughs and expresses his disagreement. The land along the river is too damp for wheat, but rice would work. Jocasta agrees–there’s profit, plus food for slaves. Wolff seems perturbed and leaves, saying he’ll return when Jocasta isn’t entertaining guests. Jamie apologizes for the offense, but Jocasta doesn’t mind. As a woman, she has to be demure with clients, but Jamie as a man can speak his mind. Phaedre fits Claire for a new dress and Claire seems uncomfortable at the attention. She tells Jocasta that the trouble isn’t necessary, but Jocasta insists it is. Phaedre describes Claire’s skin and figure to Jocasta with great compliment, her white skin, tall frame, small waist, indigo eyes, and a bosom that lassies would dream of. Jocasta remarks that some men would prefer shorter woman, like her. Phaedre gossips that Lieutenant Wolff might be one of those men who is interested in Jocasta. Jocasta denies it and shuts down the gossip to ask Claire what she thinks about River Run. Jocasta wants detail about what Claire might admire about the plantation and Claire is without words. But Jocasta can hear the disapproval in Claire’s voice. Claire admits that she doesn’t agree with keeping people as property. Claire makes up a story about coming into contact with some Quakers, which is how she has come to share their beliefs. Jocasta says that Jenny was right to call Claire spirited and peculiar. No wonder Jamie is drawn to her… that fire of a MacKenzie. The Cross Creek elite turn out for Jocasta’s party and Claire meets Lieutenant Wolff and Jocasta’s advisor, Farquard Campbell. They discuss politics regarding Native Americans and the Regulators. When Claire and Ian suggest that the Indians are right in the ire (after all, they were here first), Wolff calms them naive. If not for Europeans, Native Americans would be without the good things of civilization (UGH). 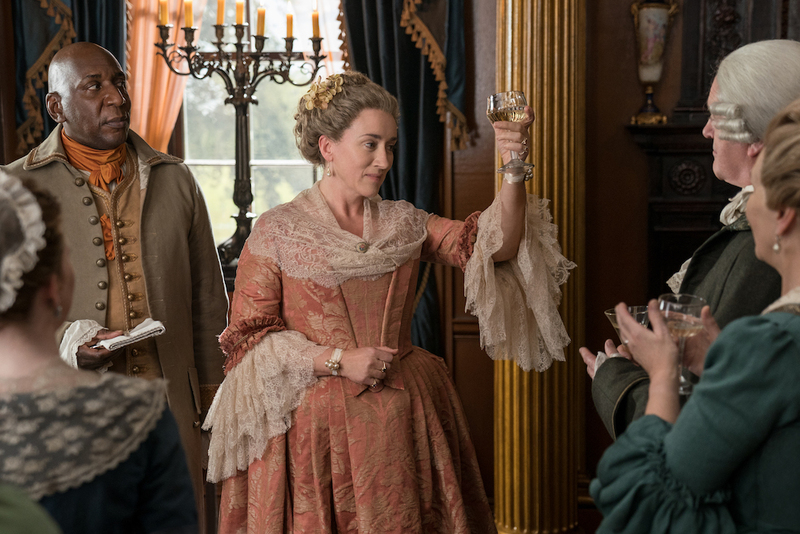 Jocasta gives a toast to Jamie, Claire, and Ian. Jocasta also makes a big announcement–she will leave River Run to Jamie, as her heir. In fact, Jamie will be master of the plantation immediately. There’s a lot of shock in the room, including Jamie and Claire! Later that night in their room, Claire is agitated. She cannot own slaves. Jamie agrees on that, but says that his aunt’s announcement was definitely calculated… something Colum or Dougal would have done. Besides, maybe if they take over River Run, they could make a difference by treating the slaves well until they can set them free. And Jamie knows he can’t run River Run without her. Claire isn’t at all convinced. The next morning as Jamie is looking over the plantation papers with Farquard, Jamie mentions that Jocasta didn’t talk to him before making the announcement. She apologizes, but has still started the process of revising her will. Jamie has a request before being named heir–he wants to free the slaves. Instead, every man and woman will earn a wage. Farquard is incensed! A plantation can’t be run without slaves. Jocasta says she’s open to discussing the matter and Farquard lists all the difficulties… the courts must be petitioned, one must be able to demonstrate the each slave performed a meritorious service, posting bond, and providing financial assurities. It’s too expensive, to the tune of over 15,000 pounds! And now Jamie is threatening the way of life in North Carolina society. The risk to Jamie and his family are too great. However, Jamie is steadfast in his decision. Jamie shares all this with Claire and suggests that there’s another way they can become landowners and live on their own terms, without slaves… by taking Governor Tryon’s offer. Claire doesn’t like the risk associated with that offer either, especially since when the Revolutionary War breaks out, they will be labeled Loyalists to the Crown. Their conversation is interrupted when Ulysses brings Jocasta outside. There’s a crisis and she needs Jamie to act as her representative. When the plantation overseer (Byrnes) struck a slave (Rufus) with his lash, Rufus retaliated by cutting his ear off. Jocasta asks Jamie to take a pair of pistols with him in the case that more trouble arrives. Claire accompanies Jamie and Farquard to provide medical attention to Byrnes. But they learn that Rufus will be executed as punishment. They arrive just as Rufus has been penetrated with a giant metal hook and is being heaved into the air. Jamie points his pistols at Byrnes and his men, demanding that they lower Rufus. Claire tries to treat Rufus’s wound. Interestingly, Farquard agrees with Jamie, that Byrnes was wrong to take matters of punishing Rufus into his own hands instead of letting the law run its course. They rush Rufus back to the house. It’s clear that the other slaves are hesitant… can Claire really put Rufus on the dining room table? Can they abandon their other duties to get Claire clean linens and hot water? Claire sedates Rufus with laudanum and begins the bloody process. She removes the hook and tries to pack the wound to prevent bleeding out. When Mary gets lightheaded from the blood, Jamie excuses her and Phaedre. Soon Jocasta and Ulysses arrives and she is scandalized that Claire is trying to heal Rufus. Claire was supposed to help Byrnes! Jamie explains that Byrnes wrongfully impaled Rufus and that Rufus is way worse off. Jocasta says it’s unfortunate that Rufus was treated with violence and Byrnes will be punished. But by law, Rufus must hang for striking Byrnes. Wolff and Campbell arrive to speak with Jocasta and Jamie, while Claire and Ian continue their surgery. Wolff and Farquard express their discontent and that Jamie isn’t prepared to be a landowner. Wolff even threatens Jamie with arrest for flaunting the law. Jamie doesn’t care and says that Rufus is under his protection. Jocasta intervenes with a promise to put the matter right. That night, we see that Claire was successful in the surgery. Rufus is even awake and able to drink some water. Rufus is agitated though and uncomfortable with being at the main house. He actually didn’t want to be healed, knowing that his death is impending for breaking the law and striking Byrnes. Claire reassures Rufus that Jamie will help him and that Byrnes is a sonofabitch, so Rufus had cause to do what he did. Rufus is surprised by the language and Ian laughs, saying that there aren’t many ladies like his Auntie Claire, able to speak words to make a sailor blush. Claire offers to bring Rufus his family, but he says his family is in Africa. He shares the story of how he and his sister (Abenna) were taken, stolen as they were playing, and forced to the slave ship. Claire tries to soothe Rufus. She tells Ian to go to bed and plans to move Rufus to her bedroom, where he’ll be comfortable. As Claire is packing up, Ulysses stands watch. Claire updates him on Rufus’s condition and her plans to do whatever it takes to help him heal. Ulysses isn’t very happy about that information. If Claire continues on this path, Rufus will face a fate worse than death. The overseers will tear Rufus, limb from limb as a warning to the other slaves never to disobey the law. According to Ulysees, it would have been better for them all if Rufus had died on that hook. As Claire sits by Rufus’ side in her room, Jamie arrives with news. They have until midnight to turn Rufus over to the authorities for his execution. Claire refuses, but Jamie’s describes the catch-22. If they heal Rufus and help him escape, the other slaves will be punished in his stead. As they’re talking, the neighbors and overseers arrive with guns and pitchforks. Jocasta warns them that the mob will kill them all… and in fact, they do start to break windows. 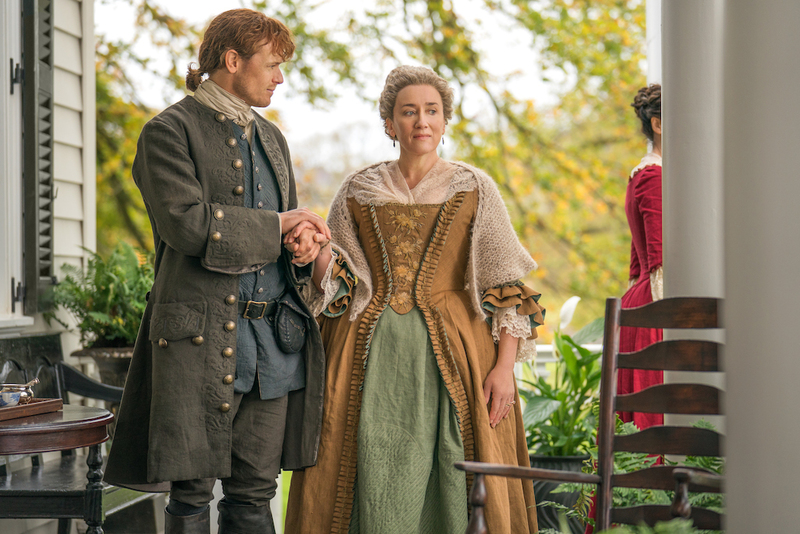 But Jamie suggests another way… yes, Claire swore an oath to “do no harm,” but she can help takes Rufus’s life in a more humane way, like Claire did with Colum. While Jocasta tries to calm the mob, Claire gives Rufus a tea “to help [him] sleep.” Claire holds Rufus’s hand and asks him to tell her about his sister, Abenna. Rufus shares how they liked to go fishing at night, and how he still does it now at River Run. He watches the moonlight and dreams about seeing his sister again one day. Claire cries and tells Rufus that he will… and then he takes his last breath. The clock strikes midnight, and Jamie and Claire pray for Rufus and for the Lord’s forgiveness. Then Jamie takes Rufus’s dead body out to the mob. And they tie a noose around Rufus’s neck, drag the body through the dirt, and hang him anyway. Jamie and Claire watch in anger. “Do No Harm” is an incredibly emotional episode. It’s wonderful to see Jamie reunited with family and have a chance at creating roots in a new community. Yet, it’s very clear that living among White people who are totally blind to the barbarism and paternalism in which they live and treat People of Color is more than they can bear. The last half of the episode following Rufus’s story is devastating to watch, as it should be. And I’m glad that again, even briefly, Rufus is able to share his story and have it treated with dignity. My one disagreement is with *how* Claire acts upon her decision to follow Jamie’s suggestion of euthanizing Rufus. I agree that taking that tea is a more peaceful way to go, especially when we see how the mob treats Rufus’s body in the end. But why does Claire not explain to Rufus what is happening? He seems perfectly able to make tough choices, and earlier on, says that it might have been better if he died of the injuries from the hook. So, if Claire had explained the situation and the purpose of the tea, Rufus probably would have agreed to take it. 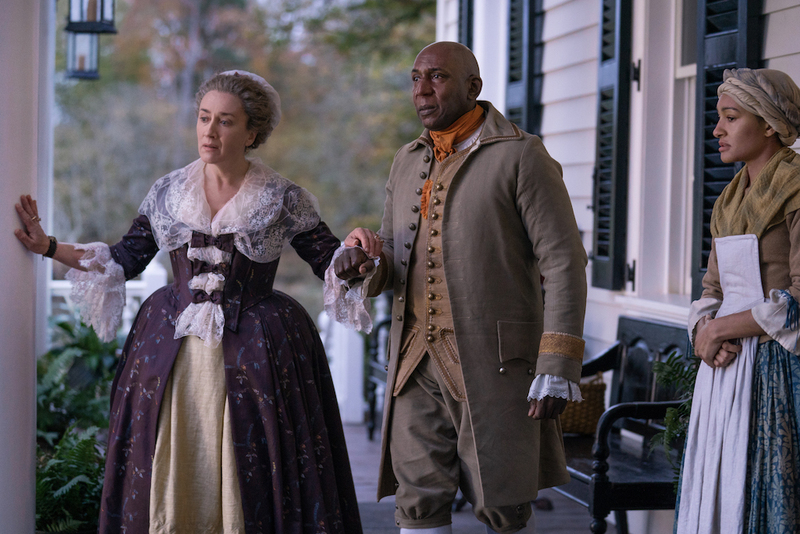 But, in this case of Claire just giving him the tea without explanation and distracting him with stories of his sister, she removes Rufus’s agency in his final moments. UGH. In any event, River Run isn’t the place for me. And I’m pretty sure Jamie, Claire, and Ian agree. For more, our video review of “Do No Harm” is now live; watch HERE!